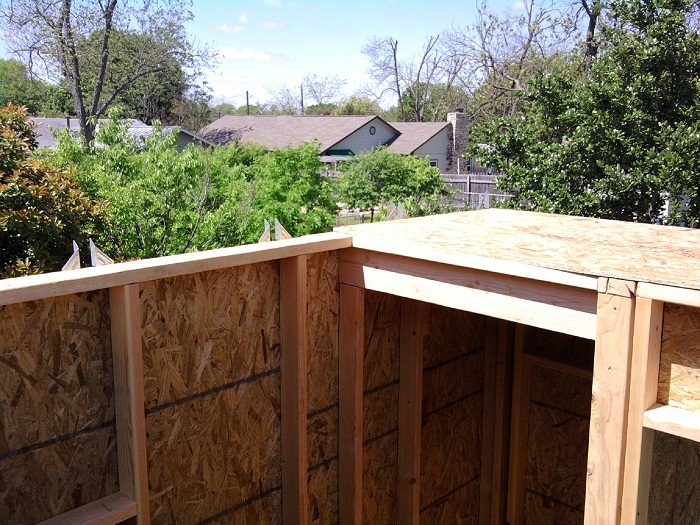 I didn’t realize how labor intensive putting on a roof was going to be. I probably should have posted on it in stages but now it’s complete so here’s the whole process. 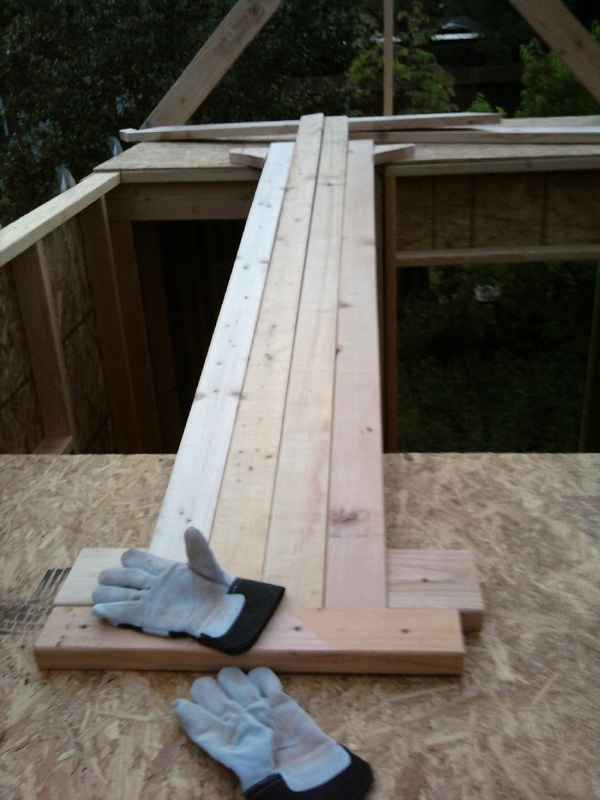 Here’s the entryway ceiling from the top along with the hurricane clips to give the rafters extra support. 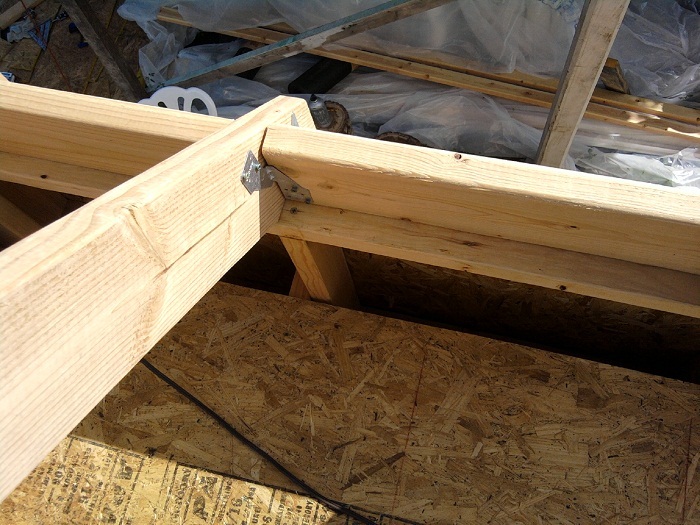 You typically install the clips on the inside of the wall but with the pitch of the roof that wouldn’t have worked. 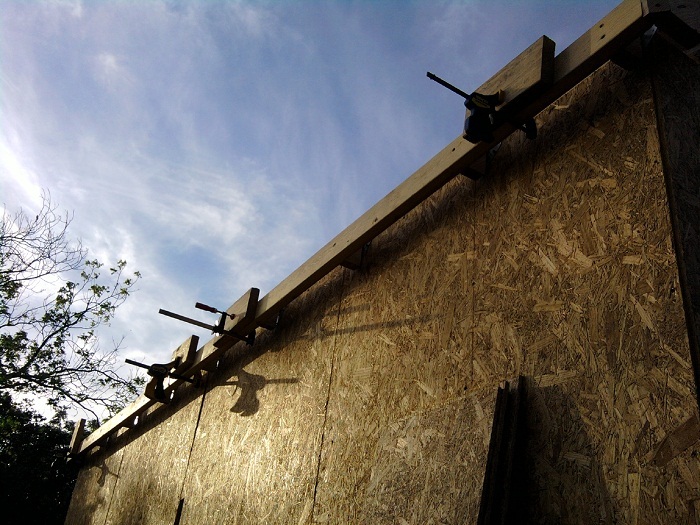 Here we are with all the rafters and the fascia installed. 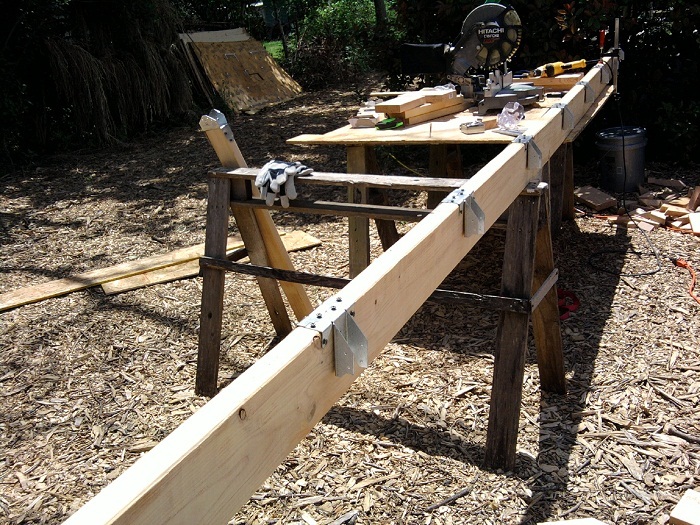 Let me tell you, clamps really saved my life on some of these steps. Below you can see what I think is called the end gable or something. 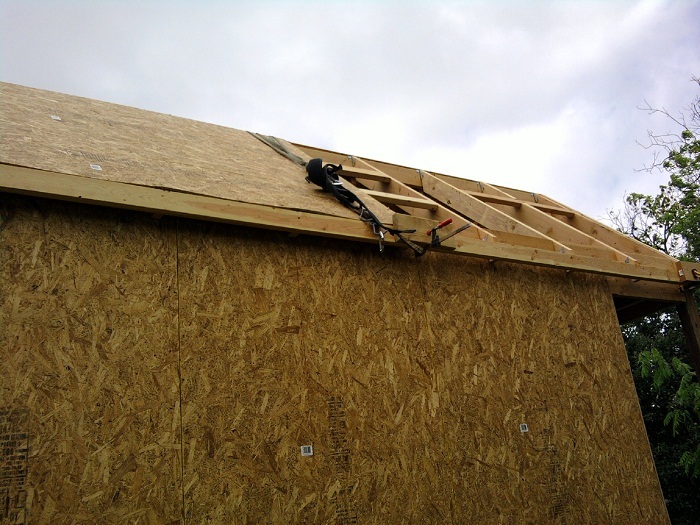 That was attached to the fascia and ridge to give an overhang appearance and keep rain from falling directly down the siding. I must have been having a bad day or something because I had to measure and cut 3 different sets of those. I’d measure and cut but when I got it up there, it just didn’t fit the way I’d measured for some reason. 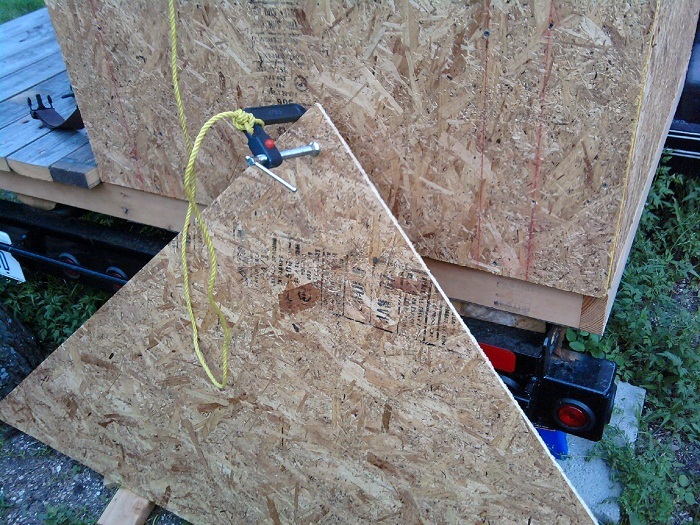 This was how I lifted all the OSB onto the roof. This piece was fine but the 4×8 sheets were killer especially trying to move them around the protruding clamps. One book recommended this c-clamp method but then dragging it up the ladder behind you. That seems like it would have been harder though. 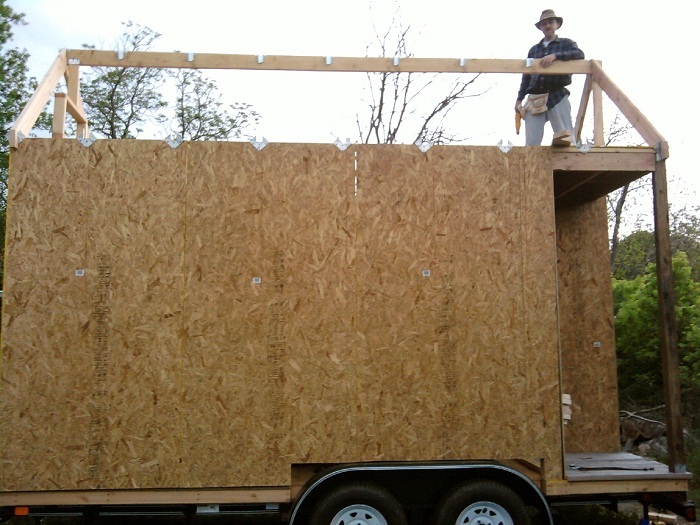 I did that with the smaller, lighter roof panels and can’t imagine doing that with the OSB. What I did do that made this part easier was to tie knots in the rope so I could pull a distance and worry less about my grip slipping. That made a huge difference. Probably using a bigger rope would have made it easier too. 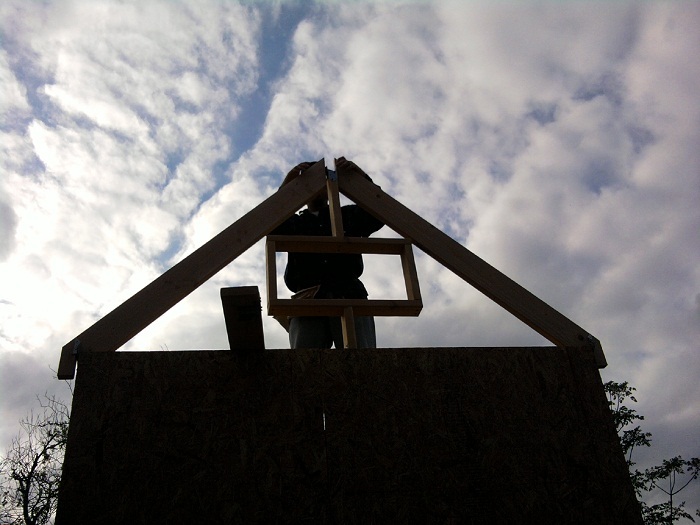 Once I started getting to the pieces at the top, I had to climb out onto the roof to attach it. 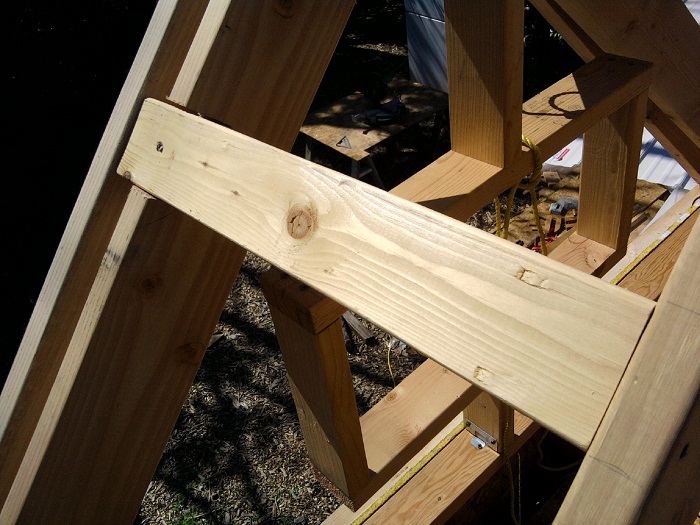 Here’s the system I used for that and the rest of the roofing work. It was a climbing harness and strap that I looped through a carabiner a couple of times. 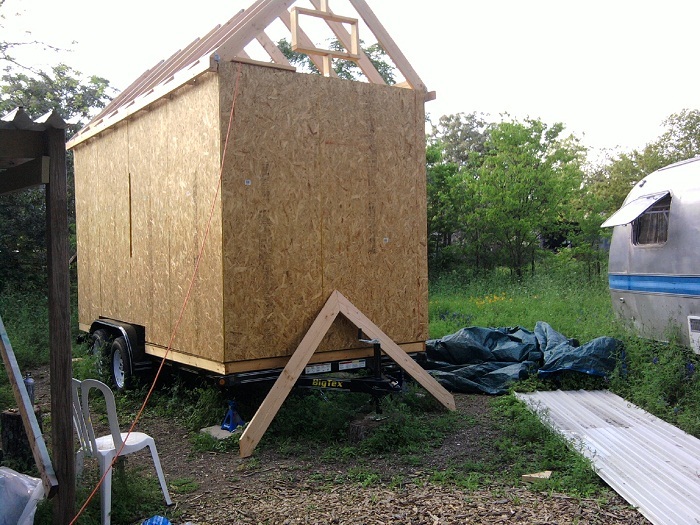 I attached the strap to the metal frame of the trailer on the opposite side. 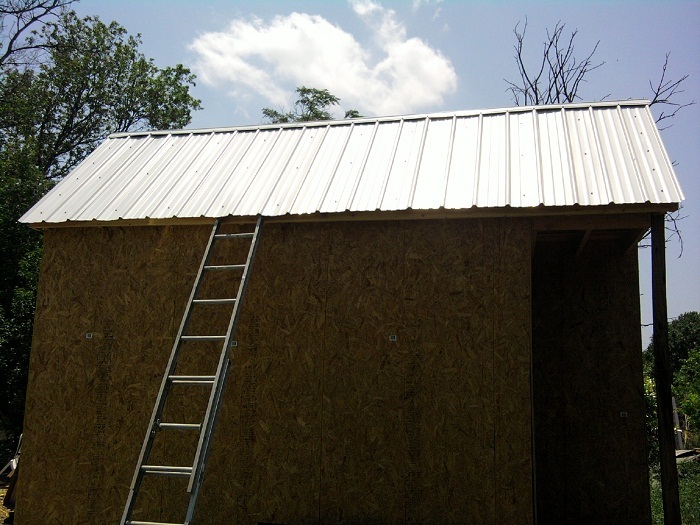 And here’s the completed metal roof. I chose white for the heat reflection. I’ll go back and paint the screws white to match later. I’m excited though that I shouldn’t have to climb back up on top of the roof. 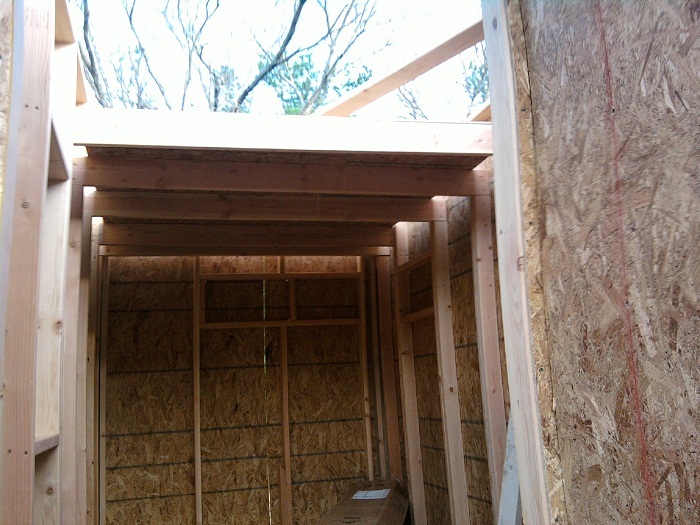 If I had it to do over again, I probably would have made the walls higher and the roof pitch lower. 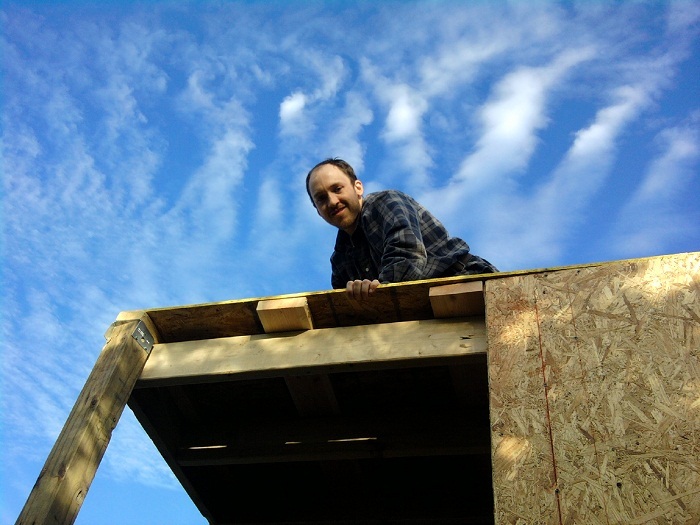 That will take more planning but climbing on the roof would be easier and that would leave more head space in the loft inside. This higher pitch is okay though because any rain or snow (or frisbees for that matter) won’t stay up there as long. 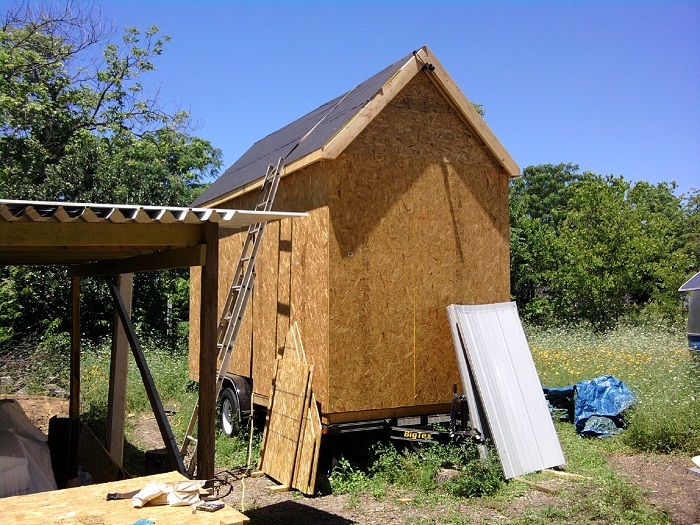 This entry was posted in Building Techniques and tagged austin, loft, metal roof, roofing, tiny house. Bookmark the permalink. Louis, this is great. You did a good job of explaining the details and the photos clarified or reinforced your details. Most importantly to me, it has helped me with my own plans. Thanks for going to all of the trouble you did to share this. Your TH is looking great! Yes, George, I got a copy of that book. I wouldn’t have been able to make it this far without it. 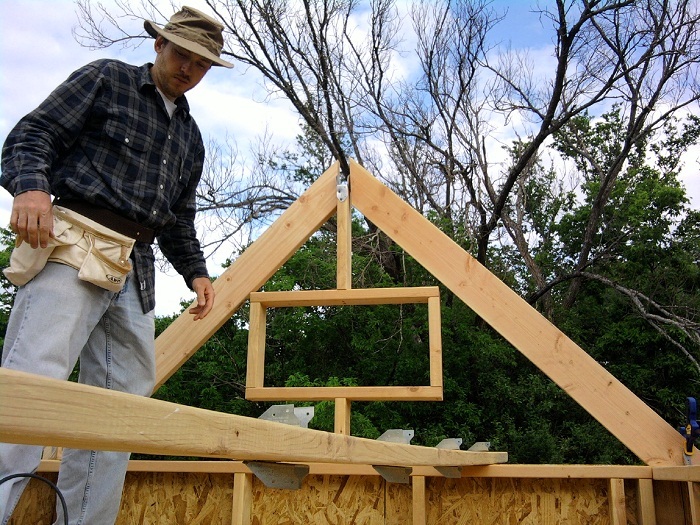 That’s where I got the clamp ideas and found an easy way to measure the rafters.